After 6 months of extensive research on the best extraction practices, Cobra Extracts cartridges developed a unique, cold refining process while working with a Ph. D chemist in Cal Tech, California. Having all their products produced in a professional laboratory setting, the company maintains stringent quality control codes through each production phase. All cannabis plants used by Cobra Extracts are locally sourced from rural family farmers that cultivate the herb without the use of pesticides or fertilizers. This enables the company to deliver to the people, the highest quality product. The hybrid cartridge from Cobra Extracts is made with top quality hybrid strains that produce between 65 – 75% THC. A refillable cartridge with a very smooth and rich flavor, the cold extraction process purifies the oil, and allows it to naturally maintain high terpene and potency levels. 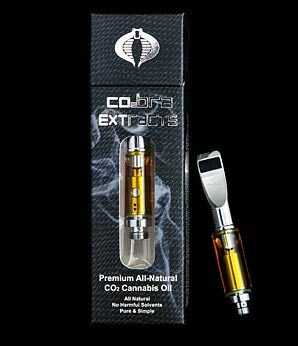 Cobra Extracts cartridges are devoid of filler ingredients like coconut oil, or any artificial additives. Just 100% organic, premium cannabis oil.. With a balanced head-body effect that keeps you happy and energetic while mildly relaxed, this hybrid is ideal for use anytime of the day.